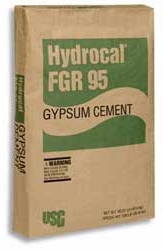 U.S. Gypsum HYDROCAL FGR-95 50 lbs. Hydrocal FGR 95 gypsum cement is a unique, high-strength gypsum cement for use with glass fiber for fabricating glass-reinforced gypsum cement products. Please note: 100lb bags of Hydrocal gypsum cement must be split and repackaged to be shipped UPS. Please expect an $18.00 Handling charge when ordering 100 lb bags shipped UPS. U.S. Gypsum Usg Hydroperm Plaster 50 Lbs. Duramold 50 Lbs. USG Hydroperm Metal Casting Plaster 50 Pounds Delivered ! #1 Casting Plaster 50 Lbs.